Trinity River Frontage & Gardening !!! 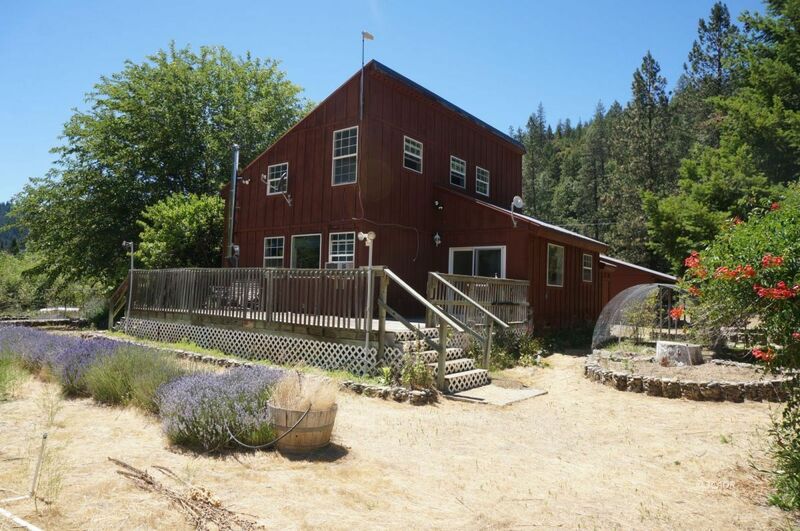 If you've ever dreamed of living on the river and having a self-sustaining property in Trinity County this is your chance! This 3 bedroom, 2 bath 1700 sq ft home sits on 1.11 acres, featuring an abundance of raised garden beds overlooking the Trinity River. There is a variety of fruit trees, grapes, a green house, and plenty of water to keep it green with drilled well & cistern system from the river, not to mention launching from your own property! Park your boat and RV in the covered parking of the extra-large detached garage with a bonus bedroom/ bathroom above + attic space. The home features vaulted ceilings in the kitchen & dining area, with a walk out deck to enjoy your evening BBQ's with a view. Upstairs is an expansive master bedroom which also has vaulted ceilings & tons of natural light, a walk-in closet with a panic room, and an attached master bath. Dual pain windows through-out, newly painted interior, wood stove heat & plenty of room for entertaining! Call today to schedule a showing, this one won't last long.